In one sense the marketing gurus of Dove beauty and skin care products hit the nail on the head. They purposely gear their ads to “everyday” women (and men). Where other brands like L’Oréal or Neutrogena for example, use outrageously beautiful celebrities to flaunt the alleged benefits of their products, Dove uses “regular people” who portray an array of everyday issues real people deal with such as low self-esteem and/or weight. They also parade a variety of women of different cultures, ethnicities, sizes and ages across their seemingly “organic” marketing platforms. Dove further claims their beauty products are essentially “pure” and contain no extra additives like many of their competitor’s products. If we are to believe their claims, this “whole package” is what “Real Beauty” looks like, which just happens to be their latest slogan. While their statistics may be real, especially since Dove actually sponsored the Real Girls, Real Pressure: A National Report on the State of Self-Esteem, it certainly doesn’t hurt the company’s bottom line is that these numbers also parlay into an incredibly vast marketing pool for their allegedly “empowering” beauty products. Do young girls and women have self-esteem issues? Absolutely! Is the general message Dove sends a good one? Yes. Every woman (and man) deserves to feel beautiful, and let’s face it, if we all realized our “”true potential,” life in general would be better for everyone. But Dove is not being entirely honest. How can they be? If they were, no one would buy their products! Like most commercial beauty products, no matter how “pure” or even “natural” they claim to be, Dove beauty products are still a cocktail of toxic chemicals that researchers know cause everything from simple allergies and obesity to more serious issues such as infertility and even cancer (2, 3, 4, 5). 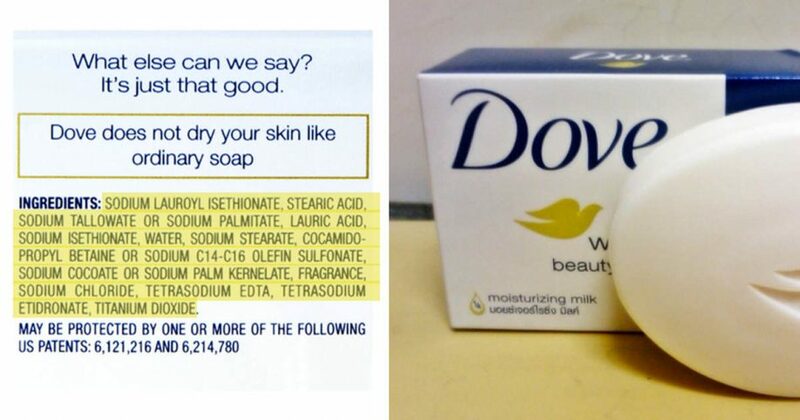 The real disconnect between Dove’s messaging and their actual beauty and skin care products is in their ingredients. 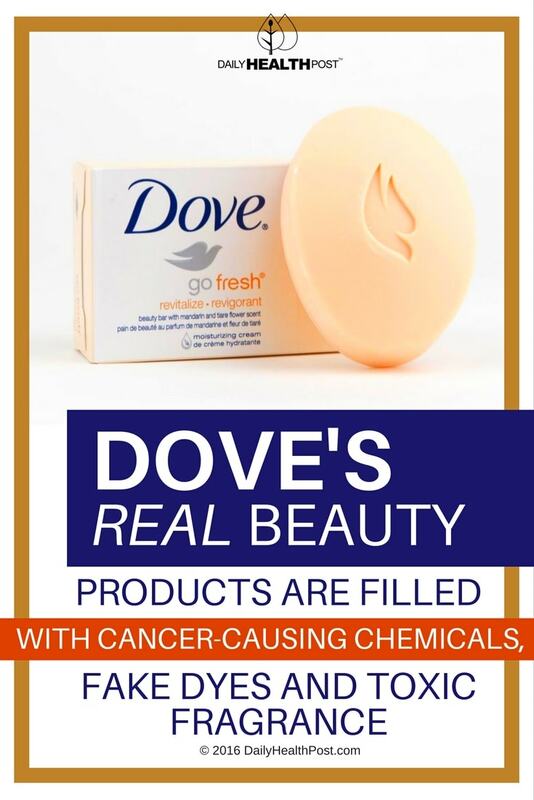 In short, the often highly toxic and definitely dangerous chemicals found in Dove products (made by Unilever) stand contrary to the message Dove pedals to consumers. These chemicals can lead to an array of serious diseases that can ultimately leave a woman (or man since Dove also has a booming men’s line) helpless and even worse off than before she/he used them. The organization further admits that, “cosmetic companies may use almost any ingredient they choose,” and the agency lacks the authority to recall products, even if deemed unsafe (6). And what’s worse, many of these chemicals have never been safety tested according to the Cosmetic Ingredient Review (CIR), so consumers are essentially unwitting guinea pigs (7). This actually makes Dove one of the worst offenders, simply because it so openly plays on women’s insecurities, which the company admits have reached epidemic proportions. Dove lures women in, like lambs to the slaughter, with promises of “finally fitting in,” finally being able to “be their true selves,” to be recognized for their “real beauty.” Meanwhile, these same women have no idea Dove’s products are linked to an array of negative health issues, and at a minimum, questionable, if not downright dangerous. For Dove products overall, the Environmental Working Group (EWG), a non-profit group dedicated to bringing transparency to consumer beauty and personal care products, rates them between a 3 and 8 on a sliding hazard scale of 0-10—10 being the most dangerous health risk to humans, animals and/or the environment, depending on the product (8). The EWG claims many of the chemicals listed in Dove products also often contain other contaminants that are much worse than the primary chemicals listed. They further list a high concern for skin, eye, or lung irritation, as well as other miscellaneous issues that put the consumer at high risk for a variety of health issues. While not as high on their degree of concern, the EWG does also list “enhanced skin absorption, biochemical or cellular level changes, data gaps in their reporting and, ecotoxicology, endocrine disruption and neurotoxicity from particular chemicals in these products.” Not exactly something that instills confidence in anyone, let alone Dove’s target market, those women who already feel insecure about themselves and how they look. For starters, even at a quick glance, it’s clear this product does, in fact, contain chemical additives, contrary to its “pure” messaging. Here are just some examples of what these chemicals and others found in Dove products actually do to your body. Cocamidopropyl betaine is a synthetic surfactant (sudsing agent) associated with irritation and allergic contact dermatitis, reactions that can be due to the ingredient itself or to impurities in it, such as 3-dimethylaminopropylamine. According to the EWG, cocamidopropyl betaine is often contaminated with nitrosamines, another chemical recognized by a minimum of five agencies as being a “possible carcinogen” and/or linked to strong evidence of causing cancer (10). Instead of actually listing the chemicals that comprise a particular “fragrance” in a product, cosmetic and personal care manufacturers simply list the word “fragrance” or “perfume.” Since the law does not currently require a detailed list of what makes up a fragrance, a product can contain any number of undisclosed scent chemicals and ingredients. In general, according to research, “fragrances” cause everything from allergies, dermatitis and respiratory issues, to cancer and they can even disrupt your reproductive system. According to EWG, these chemical mixes rate an “8” on the health hazard scale (12). The EWG tested and lists 184 Dove products with potentially harmful fragrances, including Dove White Beauty Bar, Dove Creme Mousse Nourishing Body Wash, Dove Hair Therapy Nourishing Oil Care Anti-Frizz Serum, all of their antiperspirants, Dove go fresh Beauty Bar, Revive, and a slew of men’s personal care products (13). Methylisothiazolinone is a widely-used preservative. According to numerous studies. it can cause an array of allergic reactions. Other studies suggest this chemical, which is restricted by the European Union (EU), Canada, Japan, and Germany, may be neurotoxic (14). The EWG rates it overall as a “7” on their health risk scale (15). Eighty Dove products, ranging from shampoos and conditioners to body washes and exfoliates, contain this chemical, including Dove Hair Therapy Nourishing Oil Care Shampoo, Dove Nutritive Solutions Cool Moisture Shampoo, Cucumber & Green Tea, and Dove Creme Mousse Nourishing Body Wash (17). This chemical rates “9” on the EWG health hazard scale (18). Retinyl palmitate contains palmitic acid and retinol (Vitamin A). Typically, retinol, a pure form of vitamin A, is highly beneficial for your skin. It helps to stimulate collagen production, increase cellular rejuvenation, and decrease pore size, thereby creating softer, smoother skin. Bottom line, Germany, and Canada currently ban or restrict the use of retinyl palmitate because of its proven toxicity. In the US, however, Dove’s Fresh Radiance Anti-Aging Moisturizer still contains this nasty toxin (20). In 1886, scientists discovered that compounds of aluminum are actually neurotoxic, capable of causing brain damage (21). Despite this, we continue to use it today as an antiperspirant in most deodorants. Growing evidence shows long-term use can lead to a number of neurological diseases, including dementia, autism, and Parkinson’s disease. A 2014 study published in the Journal of Medical Case Reports further links aluminum use to Alzheimer’s disease (22). A controversial documentary, The Age of Aluminum, details the “dark side” of aluminum, calling it a “toxic metal” linked to diseases like breast cancer, Alzheimer’s, allergies and autism (23). Currently, according to the EWG, 44 Dove products contain this chemical, including Dove Clinical Protection Antiperspirant Deodorant, Skin Renew, Dove Antiperspirant Deodorant, Original Clean and Dove go fresh Antiperspirant Deodorant, Cool Essentials (24). This chemical is so disruptive, in fact, it was even named the “2015 Allergen of the Year” by the American Contact Dermatitis Society (26). Most manufacturers essentially stopped using formaldehyde as a “direct” ingredient in their products because of its highly toxic nature and restricted use in most countries. Instead, they mask it by using “formaldehyde releasers” like DMDM hydantoin and imidazolindinyl urea, which slowly release formaldehyde as they decompose in the product. These chemicals work just like formaldehyde and are just as toxic. Manufacturers use them as antimicrobial/antifungal preservatives, but because they are not a “direct ingredient,” they don’t have to list them. DMDM hydantoin is a potent immune toxicant currently restricted in some types of Japanese cosmetics. According to the United States National Toxicology Program and the International Agency for Research on Cancer, these chemicals are powerful carcinogens and linked to leukemia when inhaled, ingested or absorbed through your skin (27). EWG studies show 94 Dove products contain formaldehyde releasers including Dove Creme Mousee Nourishing Body Wash, Dove Go Fresh Therapy Cool Moisture Shampoo, Cucumber & Green Tea, Dove STYLE+care Frizz-Free Shine Cream-Serum, and Dove Fresh Radiance Anti-Aging Moisturizer, Normal/Dry Skin, SPF 15 (2015 formulation) (28). They block the activity of your natural hormones. This is just a sampling of the dangerous chemicals in Dove products. The EWG shows that 39 products also contain PPG-14 butyl ether, a known carcinogen and endocrine disruptor (31). And despite the countless studies showing the dangers of BHT, 71 Dove products still contain this chemical known to cause cellular death and cancer just to name a fraction of its destructiveness (32,33, 34). The list of chemicals in Dove products is overwhelming. Currently, the EWG lists a whopping 215 different chemicals in their products that range from highly toxic to tolerable and innocuous (35). Dove (Unilever) is currently the world’s largest beauty products manufacturer with sales close to $4 million in 2014 alone, a good share of the $19 billion a year the parent company brings in worldwide. This number is expected to jump to $87 billion by 2020 (36). Right now, Dove markets their “real beauty” brands in over 80 countries, telling countless young girls and women (and men) to feel more confident about their looks. Arguably, this behemoth in the beauty industry is like a wolf in sheep’s clothing, doing more long-term damage than any real good to the average consumer through its array of toxic products.